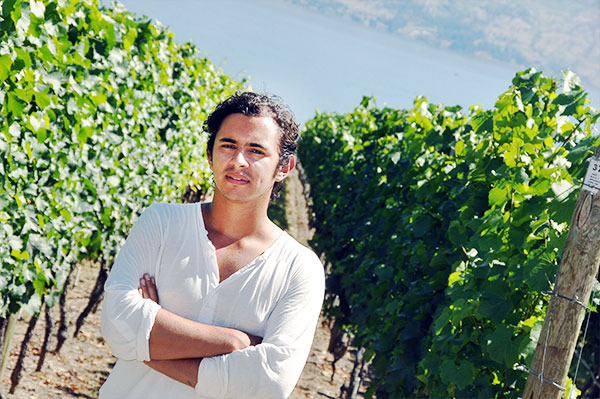 From Bogota, Colombia, to Mexico City, to the wineries of the Okanagan, PhD student Camilo Peña has been on a round-the-world research journey aimed at better understanding and documenting the relationship between marketing, consumer motivation, and social and environmental sustainability in agriculture. His ambitions led him to Quail’s Gate winery in West Kelowna, where he has immersed himself in the day-to-day activities of the winery in order gather information about the extent and impact of sustainable viticulture practices in the Okanagan Valley. Peña is investigating water use management, chemical and pesticide reduction, soil and fertilizer management, waste management, energy efficiency, and the promotion of bio-diversity. His on-the-ground research in the blazing Okanagan sun includes planting, nurturing and bringing the grape vines to fruition. The 2011 sustainability report on the British Columbia Sustainable Wine Growing Program shows there were only seven wineries out of more than 200 and five vineyards out of more than 850 in the Okanagan that participated in the first year of the program, says Peña, an Interdisciplinary Graduate Studies PhD student at UBC’s Okanagan campus. “My research is about understanding what local wineries are doing in terms of sustainability, what products they are using, why, and what impact sustainable practices have in motivating consumers to purchase sustainably grown products, such as organic wine,” says Peña. Peña is passionate about consumer behaviour. Read the full story via Making wine a greener enterprise – Kelowna Capital News. One Response to "Making wine a greener enterprise"
A wonderful company with a great team and delicious wine. We wish them good luck!